Wilmington & Weldon R.R. Company. FULTON & PRICE, STEAM POWER PRESS PRINTERS. 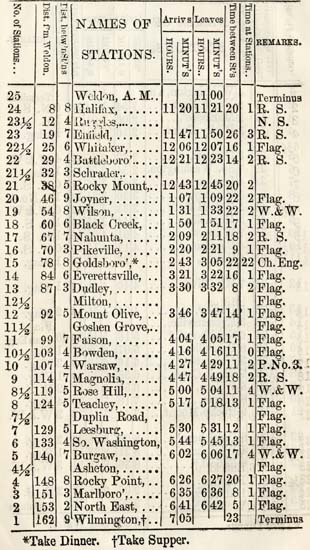 Railroads -- North Carolina -- Timetables. to observe all the instructions attached to this table. 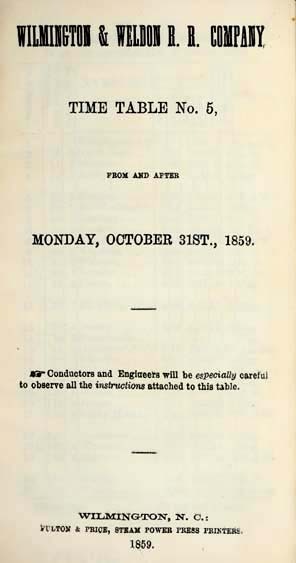 To go into operation 31st day of October, 1859. Wood and Water to be taken only at the places marked, if it can be avoided. Leave Goldsboro' on Tuesdays and Fridays at 5.00 A.M. Arrive at Weldon same days at 5.00 P. M.
Leave Weldon on Wednesdays and Saturdays after 12.00 M. Arrive at Enfield same days. Leave Enfield on Mondays and Thursdays at 5.00 A. M.
Freight Trains without Schedule will be run as extra or irregular Trains, at a speed not exceeding that laid down in the above Tables, or 11 miles per hour, loaded, and 15 miles per hour when not loaded. This order is imperative. Freight Trains will keep out of the way of Passenger Trains, and will be on the Turn-Outs at least 10 minutes before such Trains are due at the Station where they may be. When Passenger Trains are more than one hour behind time, Freight Trains may proceed cautiously--never entering a curve without stopping and sending a man ahead with a flag. The latter must always give way to the former--and must back to the next Turn-Out. 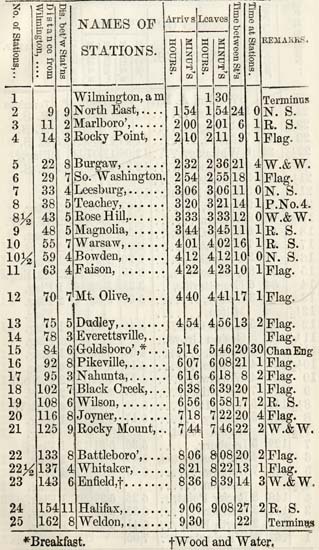 Arrive at Goldsboro', Mondays and Thursdays at 5 P. M.
To take effect on the 31st day of October, 1859, and continue in force while this Time-Table is current. 1.--Trains 1 and 4 meet at Teachey's. No. 1 having a right to the main track. No. 4 will take the turn-out, whether No. 1 has arrived or not, and will wait 10 minutes; and then proceed cautiously. No. 1 not finding No. 4 at Teachey, will wait 15 minutes, and then proceed cautiously. 2.--Trains No. 2 and No. 3 will meet at Warsaw.-- No. 2. having a right to the main track. No. 3 will wait 15 minutes for No. 2, and then proceed cautiously. No. 2 will wait 10 minutes for No. 3, and then proceed cautiously. Trains No. 3 and 4 will meet at Enfield. No. 3 having a right to the main track. No. 3 will wait 10 minutes for No. 4 and then proceed cautiously. No. 4 will wait 15 minutes for No. 3 and then proceed cautiously. Accommodation Trains will wait 30 minutes for Express, and then proceed cautiously. * 30 minutes by Accommodation Train. will go on the next preceding Turn-Out and wait until the passing Train is due at such Turn-Out, by adding 10 minutes to its departing time per table, and then proceed cautiously, olserving all the rules for safety in running, and keeping 10 minutes behind the departing time per table. 5.--Any missing Train will be looked for carefully.-- Take no risks, but always keep 10 minutes behind time until the missing train is met or heard from. Slow running around curves is especially enjoined. Road-Crossings--Day and Night. This must not be omitted. 7.--A variation of 5 minutes in arriving at or leaving any Station, will requiure a written statement of the Conductor on his report, and a verbal explanation from the Engineer. 8.--In passing Turn-Outs the speed must not exceed ten miles per hour, and in crossing the Trestle Bridges at Neuse, Nahunta, Swift and Fishing Creeks, and all covered Bridges, the speed must not exceed seven miles per hour. The speed always to be decreased in passing Curves. 9.--An extra Train (and all Trains without schedule are extra,) will be run with the utmost caution around curves, through cuts and over grades, where the track can be seen but a short distance. Head Lights will be shown at Sundown, and earlier if the weather is cloudy or stormy. 10.--No matter how much behind time the trains may be, the Trestles and Bridges must not be passed at a greater speed than seven miles per hour.--Turn-Outs and Stations at ten miles. 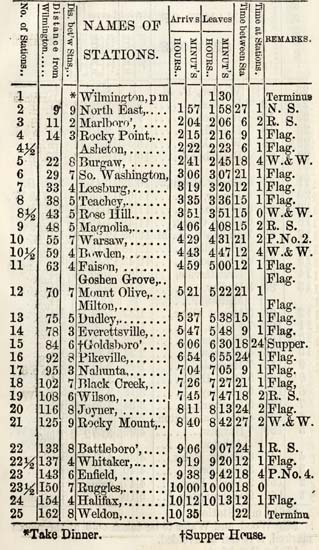 Conductors must make themselves perfectly familiar with the General Regulations for Running of Trains, together with all the instructions on this Time Table, and the order for Engineers of January 1, 1857, that are now attached to the General Regulations. that will require especial explanation by the Engineer in writing, to the Superintendent. 12.--It is not supposed that the night-train Engineers can so well guard against these accidents after dark, but all possible care must be taken to avoid a collision with animals. If delays occur by these precautions, they must occur. Life and limb, as well as property, must be cared for. 13.--Conductors are responsible for any damage arising from their train hands not being constantly on the platforms near the brakes--one between the two coaches and one between the second-class car and baggage car[.] They will be instructed to lock both brakes as soon as possible: to do so promptly, only a few turns will be given to the first windlass, when the brake-man will jump to the other windlass, and take it up fully, and then return to first one, and set it up more. This will prevent too much force being thrown upon one brake. 14.--Conductors will themselves habitually remain in the last coach, and near the hind end of it, and when the signal for brakes is given on a point of the line where they do not usually stop, they will move promptly to the brake on the hind end of this coach. Conductors will see by constant supervision that the brakes are applied in this way. 15.--Habitually insist that the train shall be stopped in the shortest time possible, and Engineers will then only signal the Brake-men a short distance from the stations, &c. This will save much time in the stoppages. 16.--All Brake-men hereafter found away from their places without orders, when the train is in motion, must be punished properly. Trains after such trains are due, when they may proceed cautiously. 18.--It is to be hoped these orders will be carried out with alacrity and efficiency by all concerned. EXPLANATIONS.--"R. S." denotes Regular Station--Train always stops. "Flag," stop if Flaged. "W. & W." Wood & Water. "P." pass trains. "N. S." No stoppage. Passenger Trains change Engines at Goldsboro'. Lose no time at stations. Recollect the signal for backing a train is two sounds of the whistle; going ahead three. Conductors, Baggage Masters and Brakeman, must never go on a train without their Badges. Accommodation Trains always wait 30 minutes for Express Trains, and never get in the way after dark upon a curve. 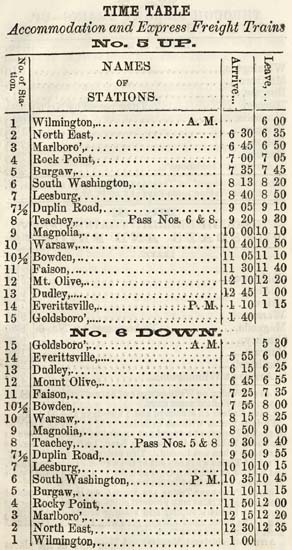 WILMINGTON, N. C., May 22, 1883. 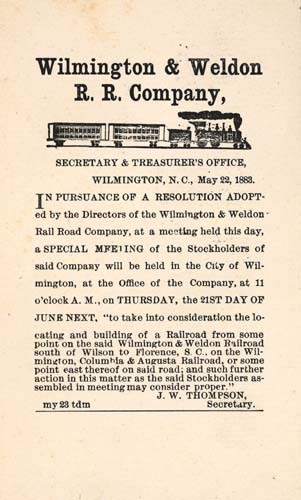 IN PURSUANCE OF A RESOLUTION ADOPTed by the Directors of the Wilmington & Weldon Rail Road Company, at a meeting held this day, a SPECIAL MEETING of the Stockholders of said Company will be held in the City of Wilmington, at the Office of the Company, at 11 o'clock A. M., on THURSDAY, the 21ST DAY OF JUNE NEXT. 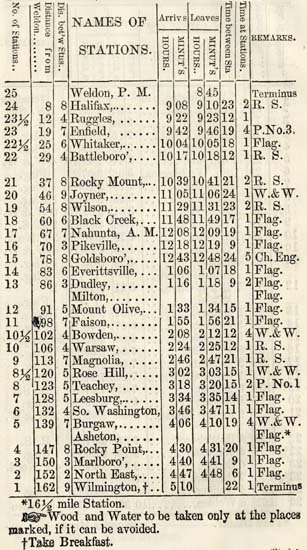 "to take into consideration the locating and building of a Railroad from some point on the said Wilmington & Weldon Railroad south of Wilson to Florence, S. C., on the Wilmington, Columbia & Augusta Railroad, or some point east thereof on said road; and such further action in this matter as the said Stockholders assembled in meeting may consider proper."